Just as with every other pet, also for fish their living space must be kept clean. Fish produce the harmful ammonia. Bacteria in the aquarium filter convert ammonia via nitrite into the harmless nitrate. The beneficial bacteria in the aquarium filter need time to develop. This is why problems often occur during the start. Do a regular water test to ensure the water is clean and healthy for your fish. With the Colombo Quicktest 6 important values can be tested quick and easy. 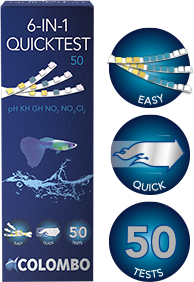 With the quicktest strip you can test pH – KH – GH – Nitrite – Nitrate and Chlorine value. With the Aquatest dripping tests you can make accurate measurements. The Aquatest dripping test are available for pH – KH – GH – Ammonia – Nitrite, Nitrate and Phosphate value. The tests are easy to use and give reliable results. 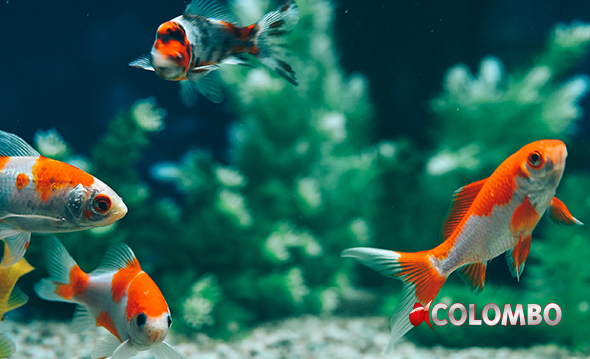 Testing the water on frequent intervals is essential for maintaining your aquarium. The correct Carbonate Hardness (KH) is mandatory for clear pond water and healthy fish and plants as well as a stable pH. KH is a measurement for the total amount of dissolved carbonates in the water. When the KH is too low the pH can fluctuate which is very harmful for the aquatic life. Increase too low values with Colombo KH plus. A correct General Hardness (GH) is essential for clear water. GH is a measurement for the total amount of dissolved minerals in the water; these minerals mainly consist of Calcium. These minerals are essential for the well being of your fish and plants. 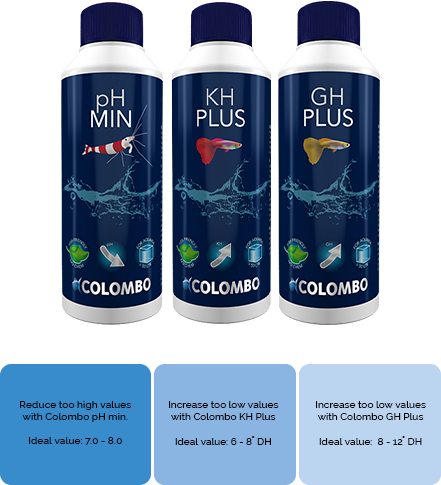 Increase too low values with Colombo GH plus. Ammonia is produced by fish in the aquarium. Raising ammonia levels are very harmful for the fish and can even cause mortalities. In the filter bacteria convert ammonia into Nitrite. Nitrite is very harmful as well but is on it’s turn converted by bacteria into the harmless Nitrate. Check ammonia – nitrite and nitrate values regularly to check if your filter is performing well. Especially during the start of a new aquarium and after a thorough cleanup it is very important to check these values frequently. High Ammonia or Nitrite levels are a direct danger to your fish. If ammonia or nitrite levels are too high, make a water change and add Colombo Bacto Start. The beneficial bacteria in Bacto Start help to breakdown ammonia and nitrite.